carrot pickle recipe | gajar ka achar | instant carrot pickle recipe with detailed photo and video recipe. carrot avakaya recipe is an instant version of indian pickle for rice and rotis as side dish. 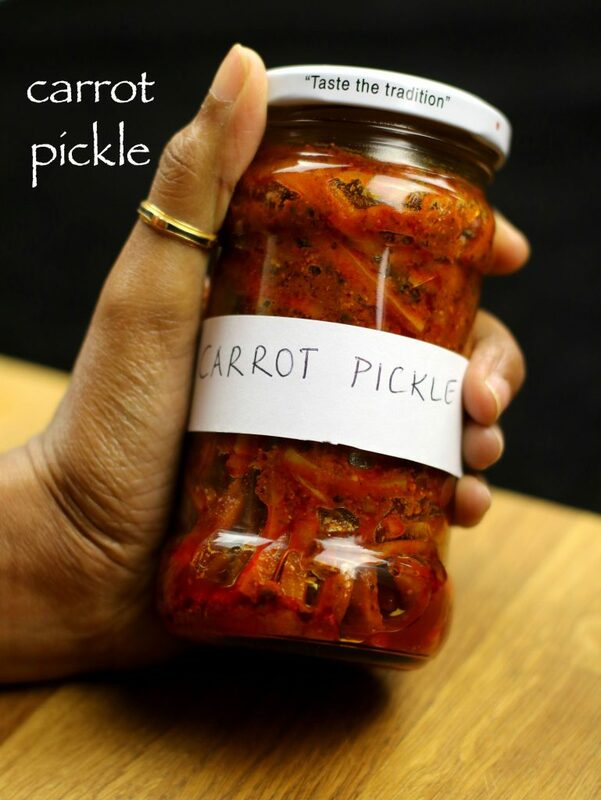 carrot pickle recipe | gajar ka achar | instant carrot pickle recipe with step by step photo and video recipe. 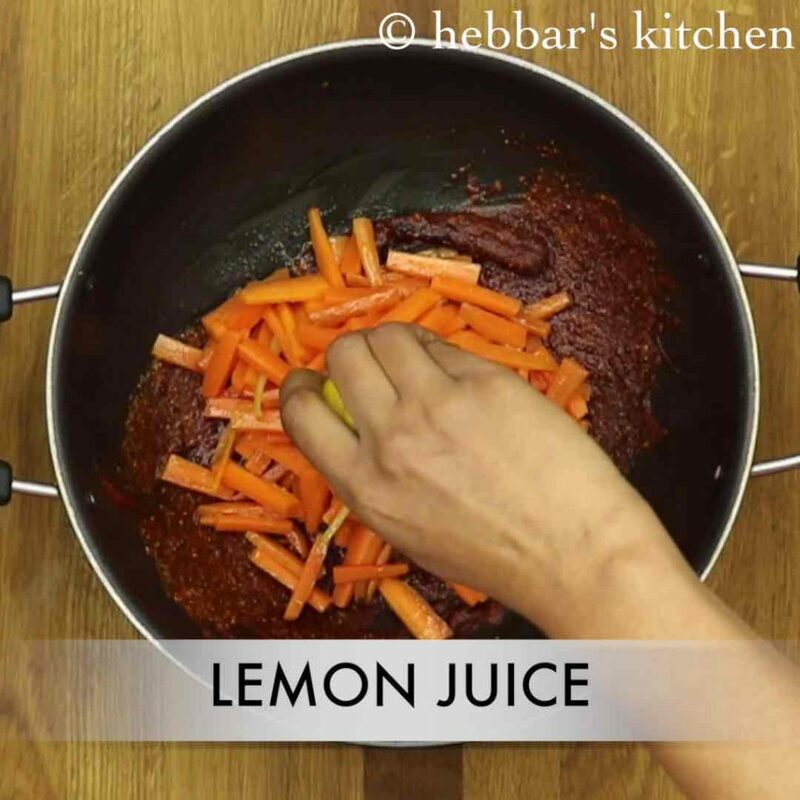 basically, gajar ka achar is a great condiment served with the meal. traditionally, pickles are prepared by vegetables or fruits which are than marinated with salt water and indian spices. 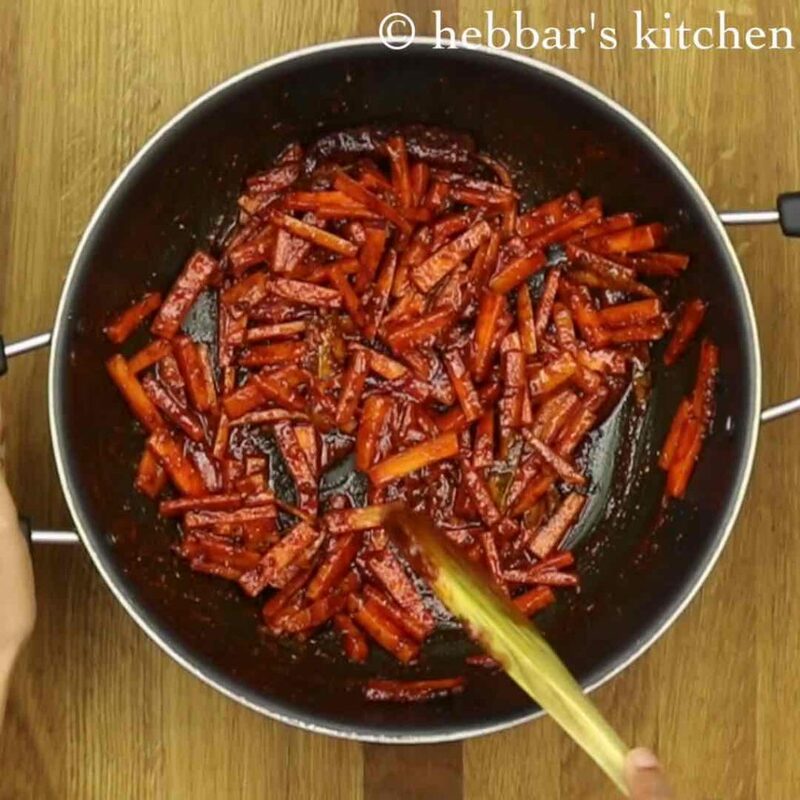 however, gajar ka achar is an instant version of indian pickle prepared with thinly sliced carrots. 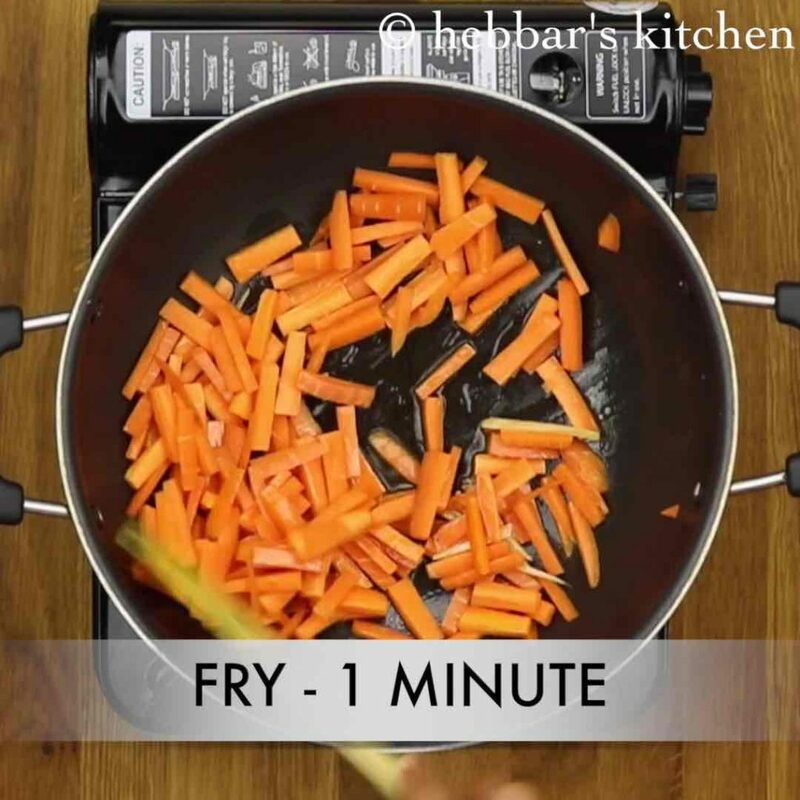 while, the instant version of carrot avakaya can be served immediately for your meal. 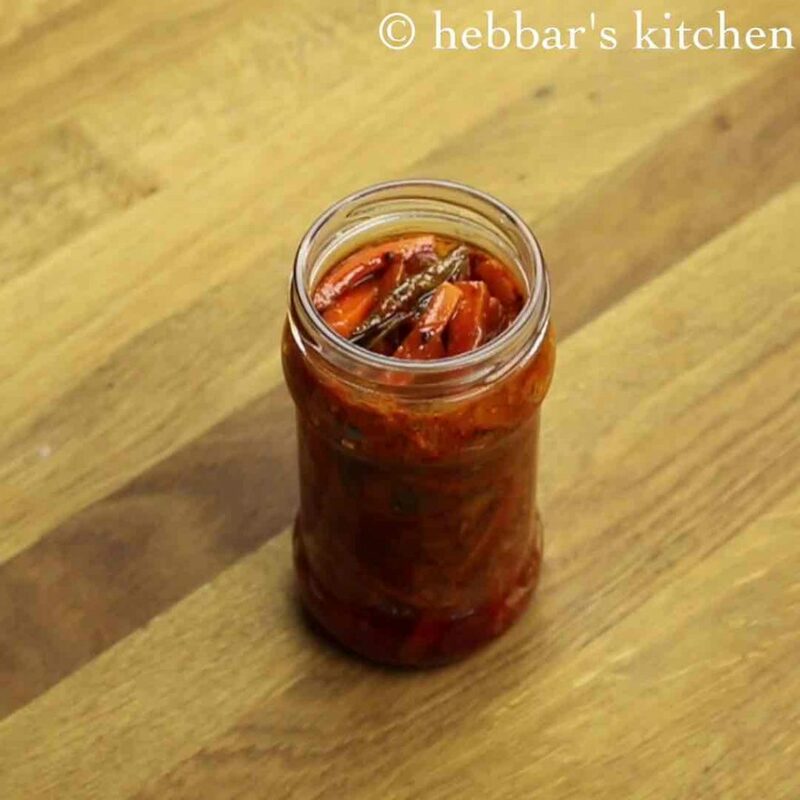 however, it tastes great when preserved for 2-3 days and then served. 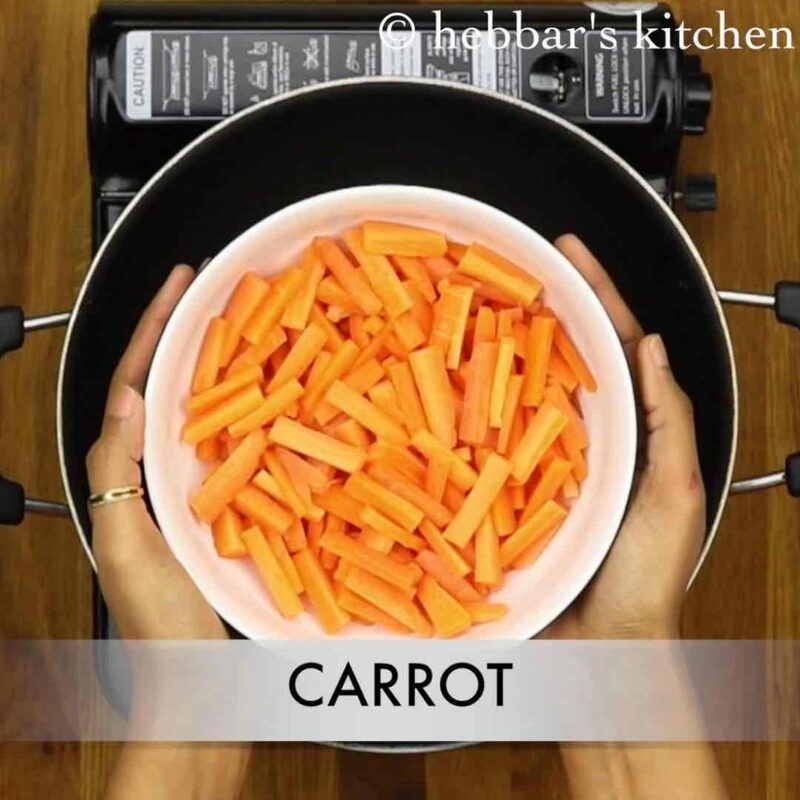 this ensures all the spicy and salty flavours are rightfully absorbed by thinly sliced carrots. moreover, the same procedure can be used to prepare from other vegetables too. almost any vegetables can be used and you can prepare mixed vegetables pickes as well. furthermore, i learnt this instant pickle recipe from my father. while, he prefers and prepared only raw mango pickle. i have extended the same recipe to carrots. perhaps, my father is correct and mango pickle is anytime great compared to carrot. however, it is neither the season of mangoes, nor i get good mangoes for pickle here. hence, i have to live with carrot pickle recipe. in conclusion, do check my other collections of chutney recipes and rice recipes. 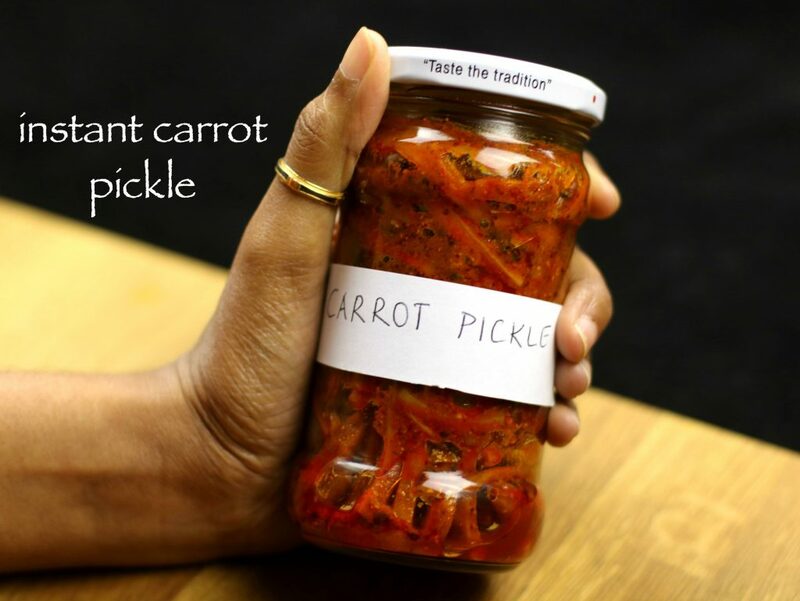 i personally, prefer carrot pickle to be served with coriander pulao or moong dal khichdi. but, you can also enjoy with jeera rice recipe, ghee rice recipe, carrot rice recipe and even with chow chow bath recipe. 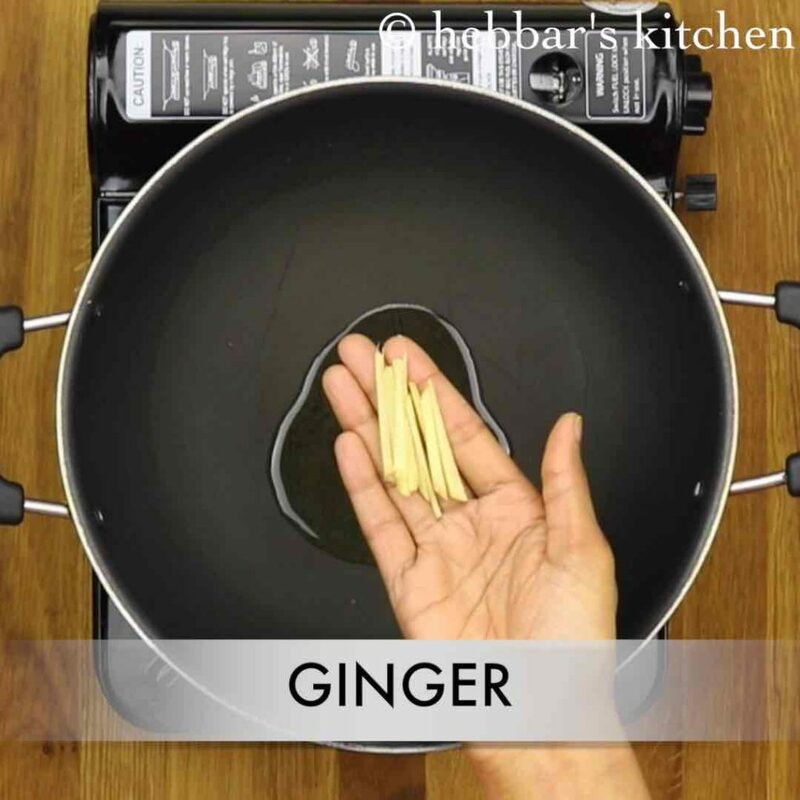 firstly, in a large pan add 2 tbsp of oil and to that add ginger juliennes (thick pieces of ginger). furthermore, add chopped carrot and saute. 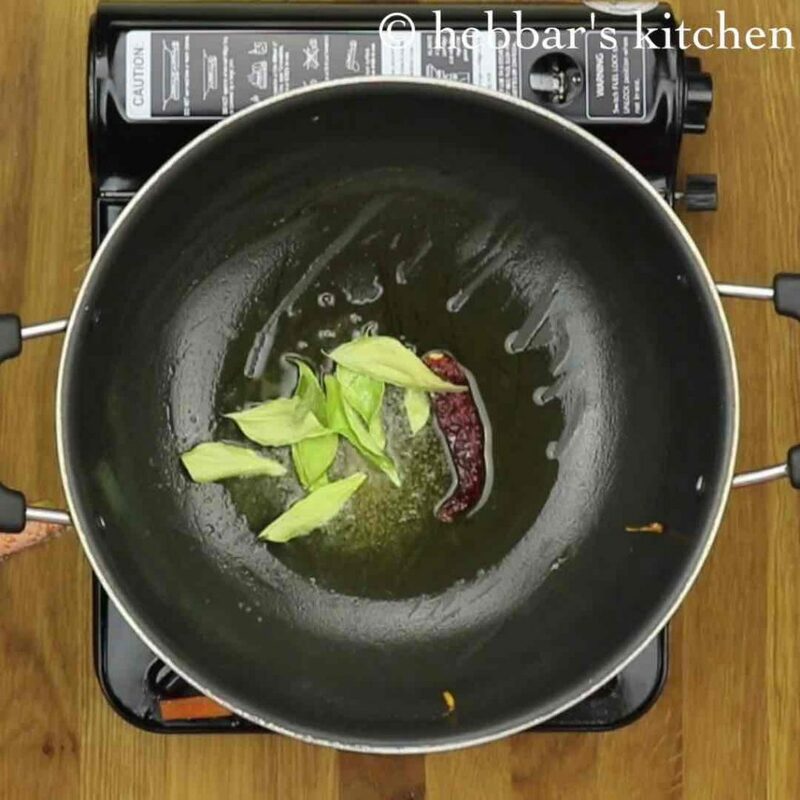 saute on medium flame for 1 minute. keep them aside. 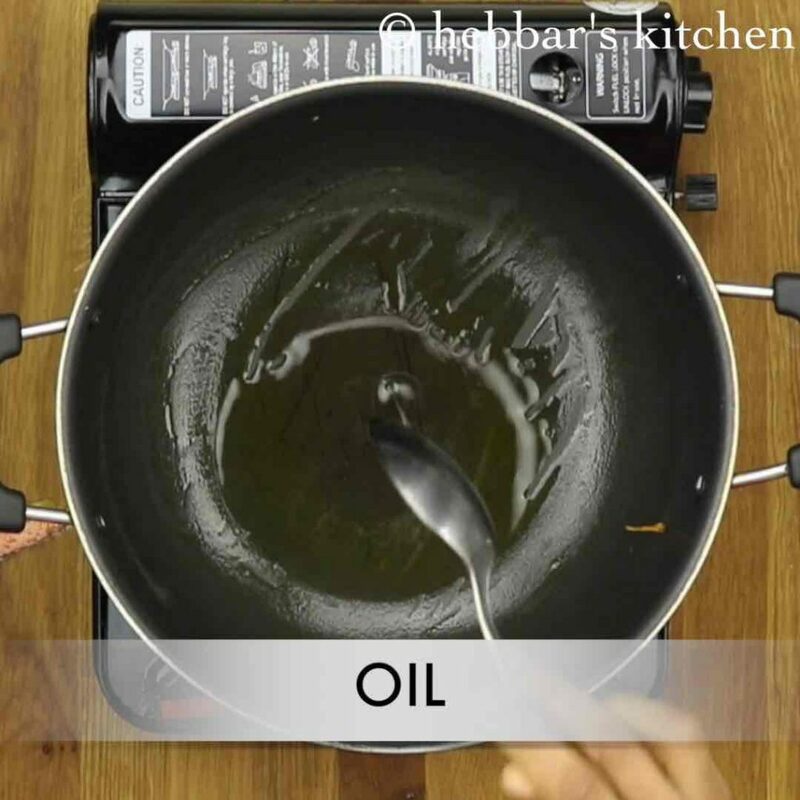 next to the same oil, add 3 more tbsp of oil. 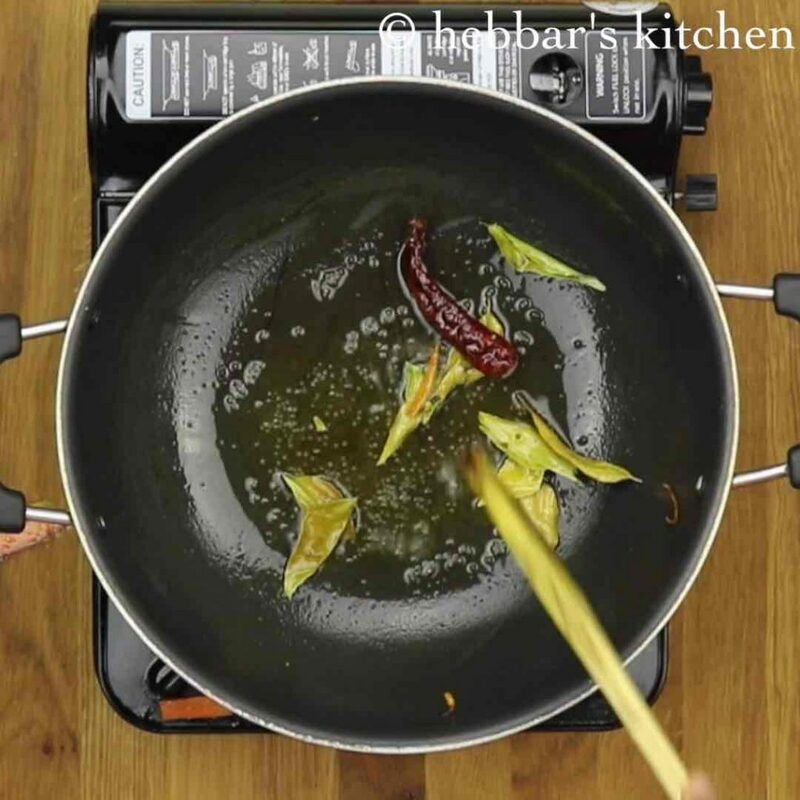 once the oil is sufficiently hot, add mustard seeds, red chilli, hing and curry leaves. saute till the mustard seeds splutter. furthermore, add 2 tsp of chilli powder, turmeric powder, mustard powder, fenugreek powder and salt. to prepare fenugreek powder and mustard powder, dry roast then powder them. give a good mix and switch off the flame. now add fried carrot and ginger. additionally, add a tsp of vinegar. also add juice of 2 lemons. then give a good mix. once the pickle is cooled completely transfer to a glass jar. and clean the sides with the help of tissue paper. finally, serve pickle immediately or store in a airtight container. saute on medium flame for 1 minute. keep them aside. 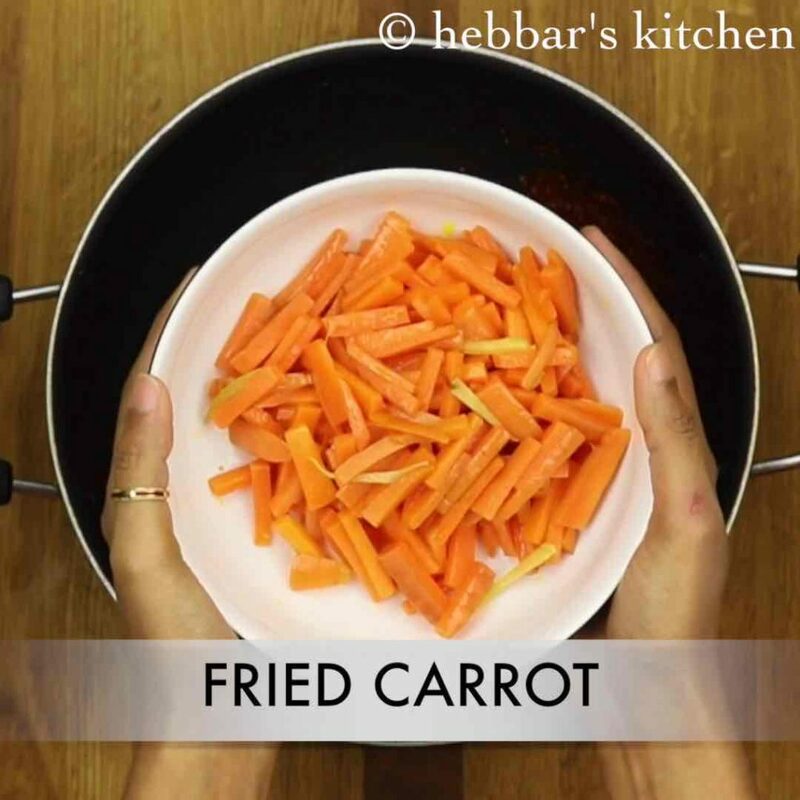 over frying makes carrot soft and loose crunchiness. give a good mix and switch off the flame. 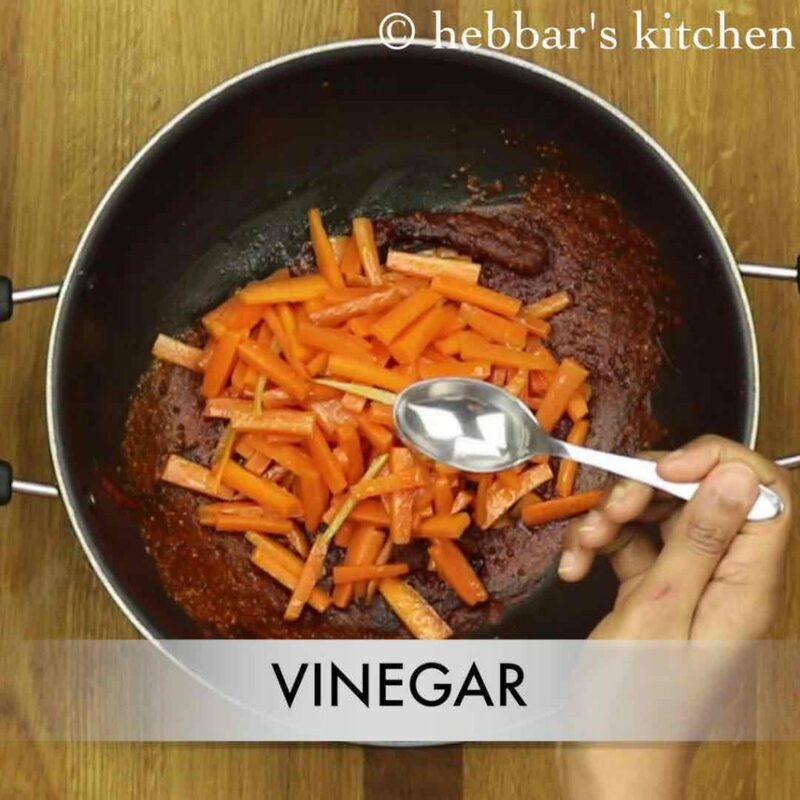 adding spices to oil gives bright red colour to you pickle. and also be careful not to burn down the spices. also add juice of 2 lemons. add more or less according to your preference. however, it helps to prevent pickle from spoiling. then give a good mix. once the pickle is cooled completely transfer to a glass jar. and clean the sides with the help of tissue paper. finally, serve pickle immediately or store in a airtight container. pickle stays fresh for a week without refrigerating. firstly, if you want to store pickle for longer time, then do not forget to refrigerate. furthermore, adding lemon juice and vinegar prevents pickle from spoiling. additionally, you can add veggies of your choice like cauliflower, beetroot, capsicum, chilli to make vegetable pickle. moreover, using til oil makes the pickle more tasty. 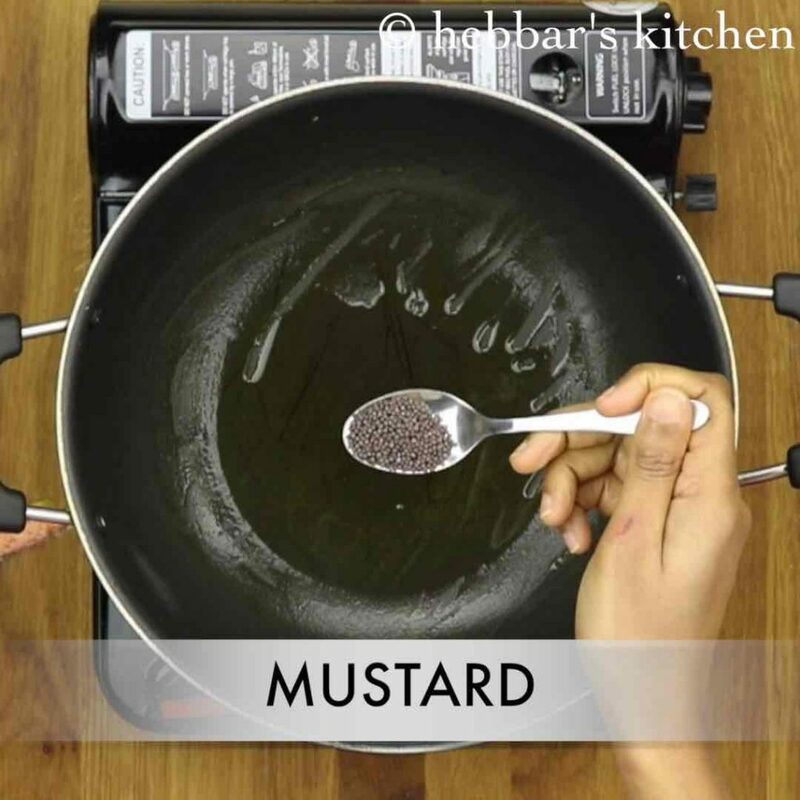 always remember to add 1:2 ratio of mustard powder and chilli powder to make a perfect pickle. most noteworthy, make sure to wash and pat dry the vegetables overnight. else there are chances for pickle to spoil quickly. finally, pickle taste great after 3 days. What are the dried green leaves? Thank you so much,I always love to cook your recipes testy and simple,God bless you . Vinger doesn’t suit me. Can I avail that in carrot pickle. I just saw your video of chilli pickle.. looks yummy.. I even liked the carrot pickle recipe. 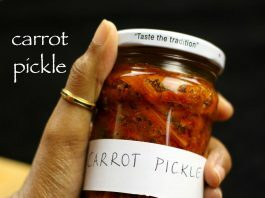 Can I add the ingredients added to chilli pickle, like saunf and coriander seeds powder, to this carrot pickle? you are welcome Keerthi Prasad. Yes you can add it to carrot pickle. Hi Nisha, I have added salt in step 6.